Although tonight’s dinner may look a whole lot like last night’s dinner, they couldn’t be more different, and not just because it’s a whole different squash! Spaghetti squash is such a unique vegetable. It’s like spaghetti, but totally natural! I stir fried some leftover meat with tomato sauce and slathered that on top of the spaghetti squash. Made my favorite healthy side – roasted zucchini circles – to add some color and round out the meal. Cut squash in half and scoop out all the seeds and gook. Sprinkle with salt and freshly ground pepper. Place squash face down in a shallow baking dish with a little bit of water. Bake at 400 F for 40-60 minutes until a tender, but not falling apart. Take out of the oven and allow it to cool. While your spaghetti squash bakes, prepare your meat sauce. Brown the meat in a large sauté pan. Discard the extra fat/liquid and put the meat on the side. In the same pan heat up the olive oil. Add the onion and sauté until golden. Add the meat back in and then add in all the spices and mix well. Add the ketchup, sauce, sugar, salt and garlic powder and mix well. Remove from the flame. Once the squash has cooled, scrape out some of the spaghetti squash, making sure to leave 1/4 inch border around the skin. Mix the scraped out Squash with the garlic powder, onion powder, oregano, sea salt and freshly cracked black pepper. 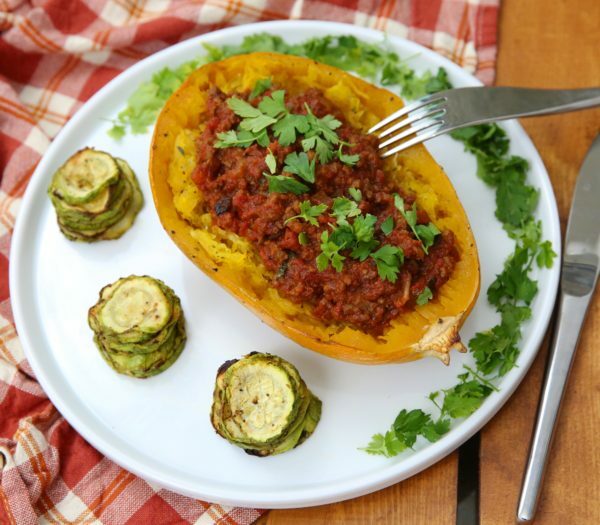 Replace the spaghetti squash mixture back into its shells and top with meat sauce. *You need half a squash for each person, so buy 1 squash per 2 people you are serving.